I don't always tend to make up our table for the holidays, so this is a new venture for me, I shared my latest Fall inspired centerpiece with you guys on my previous post, here. I am feeling the holidays once again in a different way this year, I swear it really just depends every year on what I feel like putting my time and effort into. Its usually always different one way or another. Because the dining table seems to be a favorite makeover of mine this year and I'm super in love with how it turned out, it seems to be my inspiration to do all things crafty for it. Now, you all know how obsessed I am with the Dollar store and all the neat things you can find that are worth buying from there when it comes to decorating and living frugally. So it wasn't surprising that I was able to find all the items I needed for this craft in one place. I was able to make 6 napkin rings total with only $4 spent. I bought all the items I needed from the Dollartree store. You guys know how much I love to shop there and I was inspired by all the pretty napkin rings they had at an event that I attended at Pier1 Imports not long ago, you guys might remember it from my Instagram stories. 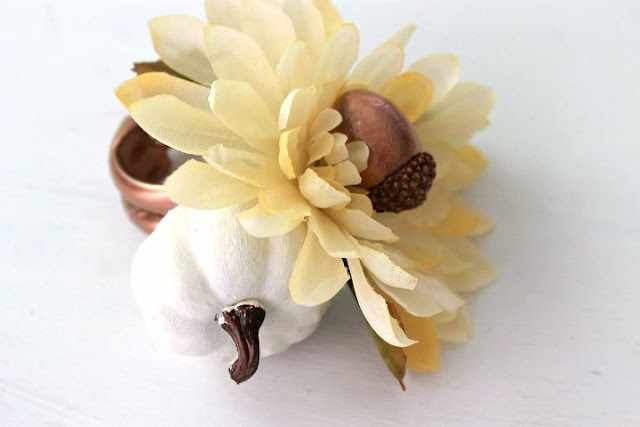 Well it wasn't hard they I walked through one of the isles at the Dollar store and noticed the shower curtain rings, figured some spray paint and hot glue and we have Fall inspired napkin rings for our table setting. Here is what I purchased. I already had the hot glue and cloth napkins. These were easy to spray paint, I hot glued 2 shower curtain rings together after the paint had dried. I then hot glued one flower to one of the rings and the painted faux mini pumpkin to the other. 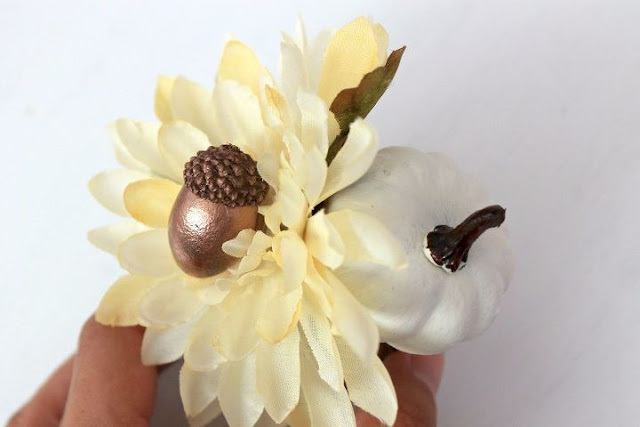 Once my acorns were dried which by the way I only gave a slight spray over to, because I did not want them fully covered in copper spray paint, I then hot glued it to the top of the flower. 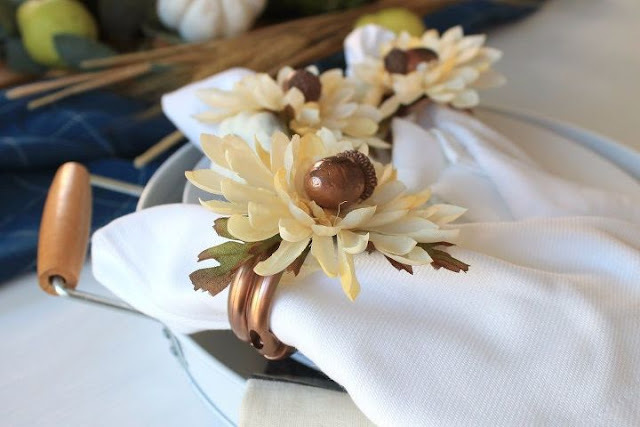 I was very happy with how they turned out and a total of 6 napkin Fall inspired napkin rings that I would have paid $4 probably for just one of them anywhere else, sounds pretty good to me. These can easily be used from October through November. Now I just have to set up my tablescape but all in time. Let me know what you think? And if you happen to make your own version or similar don't forget to tag me in your social shares! 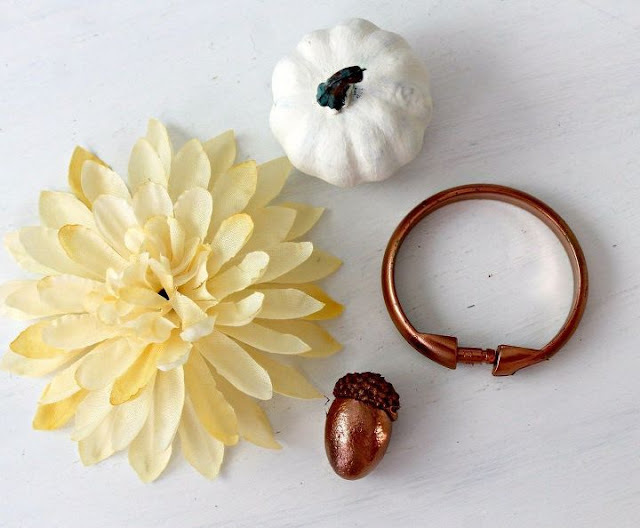 Happy DIY'ing and happy Fall! This is so creative and elegant looks like it’s from pier 1!!! I'm flattered thank you, super easy to make! These are such neat ideas. I will now be hearing to my local dollar store to see what I can find. Thank you for sharing. happy to share and yes you'll find crafty stuff there! So cute, and I love a bargain!! You definitely can, I know it! Yup, the price I spent was the best part, thanks Jaime! This is sooo cute! I would've never thought about doing this but it makes huge money saving sense 😄. Great post! Thanks Karen, happy to share how easy something like this can be!